Size 6 - $29.99 Size 7 - $29.99 Size 8 - $29.99 Size 9 - $29.99 Size 10 - $29.99 Only 5 left! Want to dress up as the sassiest leprechaun that anyone has ever seen this coming St. Paddy’s Day? Perhaps you just want to avoid all the pinches from a lack of green in your attire on that fun and wonderful holiday. 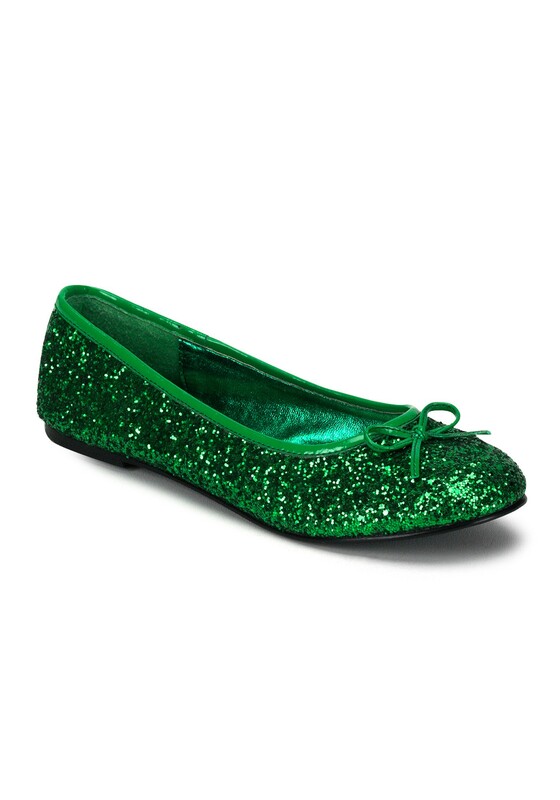 Either way, we think that these Adult Kelly Green Glitter Flats will be a perfect addition to any St. Paddy’s outfit and even to an average, everyday kind of outfit as well! These glittery green flats will sparkle as if you’ve come from a faraway, magical land. Maybe you have a hidden pot of gold at the end of a rainbow, maybe you don’t. That will be for you to know and everyone else to find out! Take a look through the rest of our vibrant green, St. Paddy’s themed accessories to complete your new festive look. Toss on a bright orange fake beard and a green top hat and start granted people's wishes or just grab a fun pair of green shades and sparkly jewelry and get ready to dance to plenty of Irish-inspired music in the party scene. The Most Beautiful Shoes Ever! I loved these green glitter flats! I almost kept them just in case I dress up for St. Patrick's Day next year! However, they pinched my wide feet and would not work on my misshapen right foot. The color almost makes it okay to hurt for a while when I wore them...almost. If you like green, can wear off-the-rack shoes, these are a must! These were the perfect flat shoes for St. Patrick’s Day in every way! They were even comfortable to wear for 9 hours straight including standing at the parade and walking around to bar hop for all the festivities!! I expected them to hurt after a few hours especially because they were brand new. I brought a spare pair of shoes and band aids so I could keep up with my friends without being in pain in case I got blisters. I was able to keep them on for the whole nine hours we were out plus wear them again the next day when it actually was St. Patrick’s Day! I look forward to Christmas or any other time I want to wear a bright pair of sparkle green flats!! I usually wear an 8 1/2 and I purchased a 9. They were a perfectly comfortable fit with no socks.